Click here if you're looking for the Final Exit NETWORK website. 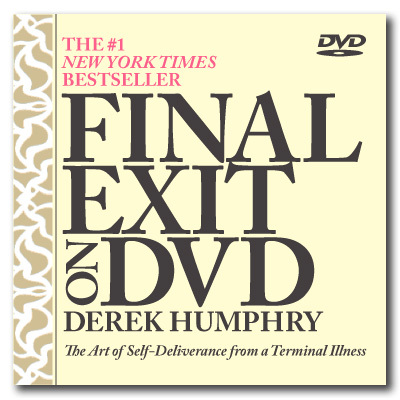 Derek Humphry interviewed in PBS Frontline episode: The Suicide Plan. 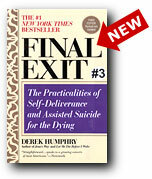 Read essays by Derek Humphry on actually helping a loved one to die and other topics at www.assistedsuicide.org. List of frequently asked questions (FAQ) on right-to-die issues. List of terms used in the field of euthanasia in this glossary. Extensive bibliography of books on the right-to-die, euthanasia and assisted suicide. Link to ERGO's December 2018 Contribution request letter (PDF). Contributions are tax-deductible and purchases from the ERGO Bookstore support ERGO. Euthanasia’s most famous textbook. The ultimate ‘how-to’ textbook selling worldwide since 1991. Spanish language edition also available. Become a Member Today. Help ERGO In It’s Work To Achieve Choices In Dying. Running a nonprofit organization with worldwide visibility like ERGO requires funding and support from people like you. Find out how you can help to further the cause of choice in dying. If you have a serious and enduring interest in this subject, consider subscribing to ERGO’s international mailing list. Exchange news and views on a wide range of right-to-die topics. Only subscribe if you in principle support the right to choose to die when physical suffering is unbearable. Pay securely with any major credit card or e-check via PayPal (Paypal processes online credit card transactions for the ERGO Store. Paypal account NOT required). Checks and money orders also accepted at the ERGO Store. Join ERGO! Help ERGO in it’s work to achieve choices in dying. 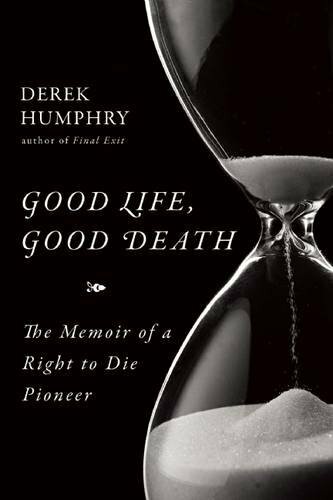 Subscribe to the World Right-to-Die Mailing List sponsored by ERGO and moderated by Derek Humphry. Is This The Day?, an excerpt from the book “Jean’s Way” by Derek Humphry.